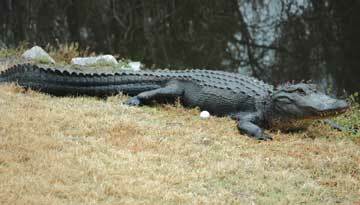 Feeding or otherwise altering the natural behavior of wild animals can have destructive consequences. Try these tips for avoiding conflict. Many years ago, my parents rented a cabin at Edisto Beach State Park. They were sound asleep when they heard a distinctive knocking at the screen door. Wondering who would visit them at such a late hour, they turned on the porch light and opened the door, only to be greeted by two masked bandits (raccoons), their paws held palm side up in anticipation of a midnight snack. Any wildlife species can become a problem for humans when they cause damage, menace pets or just become an annoyance. "Wildlife," as the name suggests, should be "wild" and not seek out human company. Unfortunately, we humans sometimes blur that distinction and unintentionally invite confrontations through our misguided actions or inactions. And there are a few species that tend to appear in the nuisance line-up more than others, including coyotes, Canada geese, white-tailed deer, black bears, raccoons, squirrels and bats. 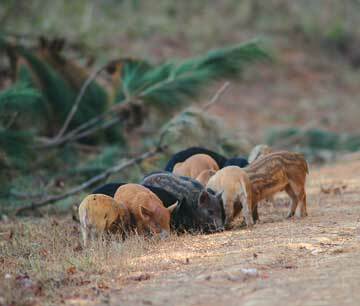 Coyotes, like feral pigs and armadillos, aren't native to South Carolina. They began appearing here in larger numbers in the 1980s, when the slow natural migration of coyotes from western states got an artificial boost from misguided hunters who illegally transported them in-state for the purpose of running hounds in penned enclosures. When they inevitably escaped, the coyotes thrived in the ecological niche left vacant by red wolves. Although coyotes usually confine their diet to rodents, rabbits, carrion, insects and fawns, they are opportunists, and won't pass up the occasional housecat or small dog. That's when they cross the line and become a nuisance for most people, though it's their impact on the state's white-tailed deer population that worries hunters the most. Looking like medium-sized dogs, coyotes can cause sympathetic dog lovers to inadvertently encourage closer contact by trying to feed them. As coyotes lose their fear of humans, they get bolder and more aggressive. Then it's bad news for the coyotes when they have to get permanently "removed." Resident Canada geese in South Carolina have become accustomed to living around water sources, golf courses and lawns, where they generally make a mess of things, to put it mildly. As they graze, they defecate in or near water bodies, causing pollution and unsanitary conditions, and increasing the risk of E.coli entering drinking water sources. In addition, the rise in nitrogen causes harmful algae blooms, which reduce the amount of oxygen in the water and can result in fish kills. 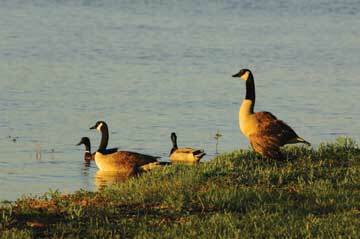 Piles of goose feces are unsightly and can make burn marks in lawns and on golf courses. Overgrazing by large flocks of geese over time can cause total loss of plant life around water bodies, leading to soil erosion. 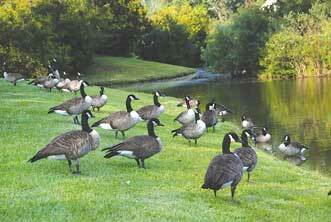 However, we humans tend to encourage the geese to hang around when we throw bread crumbs and such to them. We think it's fun and that we are "helping" feed them when, in fact, we are encouraging the birds to stop foraging on natural, nutritious foods and become dependent on humans for handouts. A goose accustomed to humans can become aggressive and may pose a problem if it nips at or batters someone with its wings. White-tailed deer are habitat generalists, meaning that they are capable of surviving in a wide variety of places, including urban neighborhoods. Deer in urban areas can quickly become overpopulated due to limited predation and reduced hunting pressure that occurs in these settings. After exhausting native browse, they become bold and begin to venture into yards to eat landscape plants. Destruction of habitat by over-browsing decreases the availability of food and shelter for other wildlife such as songbirds, pollinating insects and small mammals, some of which are state-listed species of concern. In some cases, landscape plantings that have been fertilized and irrigated become more nutritious than natural foods and are targeted by deer first. As high-protein, high-nutrient-content plants are depleted, deer will move on to many supposed "deer resistant" plants. A single deer can consume up to seven pounds of vegetation per day. When people put out corn to lure deer closer for a wildlife viewing opportunity, these deer may lose their fear of humans and become bold, leading to potentially dangerous encounters. Bucks, during the rut, can be especially dangerous. An overabundance of deer can also indirectly increase the likelihood of the transmission of diseases such as Lyme disease to people and pets, as deer are the natural host of the ticks that harbor the bacteria that causes the disease. When urban deer numbers exceed the carrying capacity of the habitat, removal of excess animals is necessary to protect the overall health of the herd, the environment and people's property. The most effective way to manage overabundant deer is through lethal means, and some communities in South Carolina have resorted to that tactic. However, it is wiser to avoid the problem by encouraging (where feasible) hunting during regular seasons and by using tactics that prevent conflicts in the first place. For instance, plants used in landscaping should be those that are the least palatable to deer. 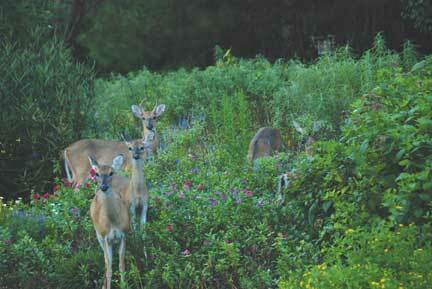 Native plants are a good choice, as they are more likely to survive deer browsing pressure or repel it altogether. In general, deer avoid plants with fuzzy textures, as these irritate the mouth. They also dislike strong-smelling herbs and plants with a high latex or toxin content. Waxy foliage and thorny stems also make great deterrents. Scare tactics, such as noise makers and repellants, only work for a short while, since deer quickly become accustomed to them. Bucks can also strip the bark from ornamental saplings as they seek to rid themselves of velvet or make rubs. Placing shelters around the base of young trees can help protect them from this damage. Wire cages and bird netting can be used around smaller plants. Deer are a natural and historically important part of the environment in South Carolina, and keeping conflicts with humans in urban areas to a minimum will help maintain that positive image. Besides deer, another charismatic large mammal in South Carolina that can become unwelcome in urban areas is the black bear. South Carolina has both a coastal and a mountain black bear population. The mountain population is growing, but so is the construction of new roads and residential/commercial developments in our Upstate. When travel corridors between suitable habitats are not maintained for bears and other wildlife, increased conflict with humans is inevitable. Young bears in search of new territories can travel up to 150 miles, often through highly populated areas. Black bears are primarily vegetarian, but will also take fish, deer fawns and the occasional pet. Bears are also notorious for raiding trash cans, campers' supplies, bird feeders and compost bins, and for destroying cornfields and beehives (for the grubs more than the honey). People in bear country can deter them by securing trash cans, removing bird feeders, cleaning and covering barbecue grills, feeding pets indoors and using electric fences around gardens and beehives. Bears have a remarkable homing instinct coupled with a great sense of smell, and even when relocated, they may try to return if they are not carried far enough away. Sadly, bears that lose their fear of humans have the potential to become aggressive and are often euthanized. That is why wildlife biologists say that "a fed bear is a dead bear." 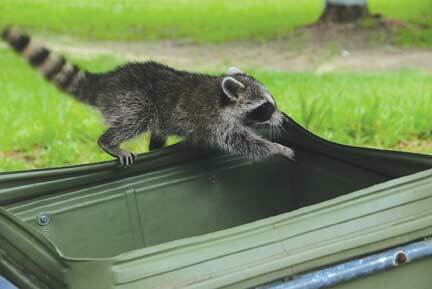 Perhaps the most notorious trash can raider is the raccoon. With those nimble little fingers, these nocturnal bandits can pry open lids, rummage through compost piles and catch goldfish out of backyard ponds. They are also quite good at getting into chimneys and attics where they tear up insulation and anything else they can find to make a bed and even raise their young. If pet food is left out for raccoons to find, this will only increase their desire to hang around. Invariably, a fight between the family pet and a determined raccoon will erupt. Like all wildlife, raccoons harbor their share of parasites and diseases that can be passed to pets and humans. The most notorious of these zoonotic diseases is rabies. 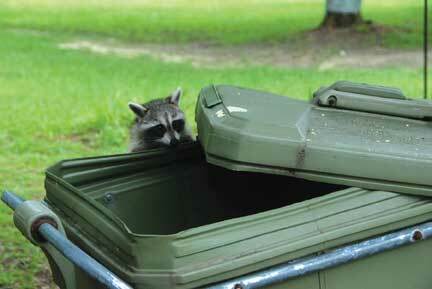 To prevent possible confrontations with raccoons, secure all garbage can lids with a latch, feed pets indoors and close off possible entrances in human dwellings, including doggie doors. Metal flashing or one-inch mesh hardware cloth can be used to secure openings around eaves or dormers. Another home invader and bird seed thief is the gray squirrel. Reinforcing the entrance holes on bird houses can keep squirrels from enlarging them and taking over. In addition, a baffle can be placed on birdfeeders. All rodents have the potential to cause extensive damage as they chew and gnaw on structures and wires. These species can be discouraged from entering human dwellings by tightening eaves and replacing rotten boards so they cannot chew their way in. Place mesh screens over vents, louvers, fan openings and cap chimneys. Trimming overhanging trees will also help deter squirrels from making a short leap to the roof. Foundation openings and porches should be closed off with concrete, sheet metal or wire mesh. Although not a rodent, bats also intrude into some of the same areas and can be kept out with quarter-inch hardware cloth, wire mesh or simply by caulking gaps. Placing bat boxes in appropriate locations can provide a safer alternative for these beneficial insect-eaters and a more sanitary option for the homeowner. Of course, if any animals are already in the home, they must be removed and the repairs made after eviction. The S.C. Department of Natural Resources keeps a list of nuisance wildlife control operators in every county. These individuals or companies are not endorsed by the DNR, but simply listed as available to assist (for a fee). Relocation of offending animals to other areas is not advisable and sometimes illegal due to the risk of disease spread, pressure on the receiving population and the possibility of dumping the problem animal on other unsuspecting landowners. It is important for people to realize the importance each species plays in the environment. Viewing wildlife can be a pleasant experience, but to keep it that way, it's best to let wildlife remain wild. In the end, the animals are healthier and we all can coexist happily. Anna Huckabee Smith is a freelance writer and former urban wildlife biologist with the North Carolina Wildlife Resources Commission.